For months, Apex Legends players have suspected that Titanfall 2's L-Star LMG is coming to Respawn's free-to-play battle royale. Evidence has been piling up, from a curious Twitch Prime ad to an extracted 3D model, and I'd say the cat is very much out of the bag after this week. Reddit user Coltonj1225 recently found a smoking gun in the form of a Legendary weapon skin for the still-unannounced weapon. Incidentally, 'smoking gun' really is the word here. 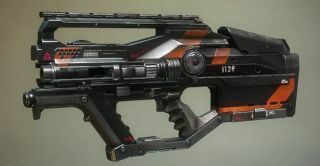 In Titanfall 2, the L-Star was an energy LMG with a theoretically bottomless magazine, but it would also overheat and start to smoke when fired continuously for extended periods. Skillful players could avoid this downside by pacing their shots to allow for cooldown periods, and if you treated the L-Star with care, you could play entire rounds without actually reloading. Last week, Respawn revealed what looks like a new SMG or assault rifle in a Reddit post. It doesn't look like the L-Star, but it may be another new weapon. Many of the best Apex Legends weapons came straight from Titanfall 2, and most of them are pretty faithful recreations. We know the L-Star will be an energy weapon when it comes to Apex, but will it actually use energy ammo or will it follow the same cooldown system as before? The Titanfall 2 version also fired notoriously slow-moving rounds which forced players to lead their shots. This is especially interesting since Apex’s previously released weapon, the Havoc energy rifle, can fire charged rounds with no travel time. I'm anxious to see how the comparatively sluggish L-Star feels in the Apex sandbox. The latest Apex Legends patch notes outline new report functions and a handy team-building button.